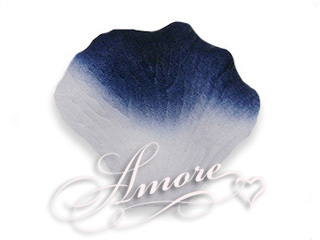 This petal is so striking and chamatic, starts at a white and tip of petal in a Navy blue, velvety looking. NO small or sheer petals. Rich in color and feel. Petals size is 2 inch H x 2 1/4 inch W. One bag contain 200 silk wedding rose petals.